Used armored truck for money transport, prison transport, tactical teams or any purpose that requires a used armored truck secure transportation. Used Armored Vehicles are committed to safety and unparalleled quality and service in all the trucks we provide. Every used armored truck meets or exceeds the Federal Motor Vehicles Safety Standards. for your armored transportation needs! Every used armored truck built is equipped with high quality galvanneal, stainless steel and aluminum plate metals. We utilize the only certified armor plate manufacturer in the market today, Clifton's High Hard Ballistic Steel, for high end threat levels. Kevlar or Spectra, for lightweight armor materials to deflect the high end of threat levels and can be laminated to varying thickness. Glass armor, a lightweight combination of laminated glass, chemically strengthened glass and lightweight polymer compounds. 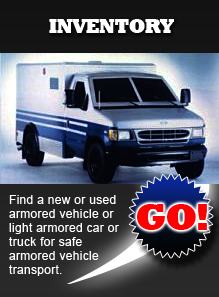 Find a used armored truck for money transport, tactical swat teams, prison transport for secure transportation.